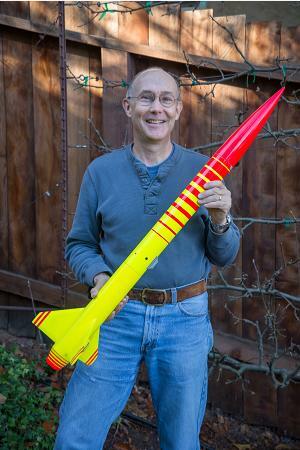 I first started flying model rockets when I was in junior high. It was an article in the July 1967 issue of Popular Mechanics magazine that introduced me to the hobby. I ordered an Estes Alpha starter kit, and I was hooked. I still remember pressing the starter button for the first time. After the 10 count, the rocket just disappeared - we weren't ready for that! I built mostly Estes and Century kits and flew them with friends at the large athletic field of the university in my town. Shortly after, I found an ad in Popular Mechanics for a new magazine call Model Rocketry. I subscribed to the charter, October 1968 issue. It was published by members of the MIT model rocket society, and contained a wonderful mix of design and technical articles. Model Rocketry magazine served as a window into the world of model rocketry beyond just flying with friends. I enjoyed the technical aspect of the hobby as much as the design, building, and flying. I was fortunate to live only 80 miles from Boston, and I had the opportunity to attend the MIT Model Rocketry convention (MITCON) for several years while I was in high school. There I met many of the notables who were contributing to the advancement of the hobby. I especially enjoyed the R&D papers, and, when I was a senior, I won the junior R&D competition with a paper that analyzed the Freon model rocket engine that was manufactured by Vashon. Even though I went on to attend MIT, I dropped model rocketry. I attended one meeting of the Model Rocket Society, but studying and other activities took priority. I had thought I would study aero/astro engineering, but it was 1973, and the Apollo program was over, the shuttle has not really geared up, and future job prospects did not look good, so I choose electrical engineering. I worked for Agilent Technologies, now Keysight Technologies, the largest electronics test and measurement company as an an R&D engineer and manager for 38 years before retiring. Fast forward to the mid 90's, and I happen into a local hobby store. There, on the magazine rack is a copy of High Power Rocketry magazine. Things had certainly changed in 20 years! The hobby had grown up. I picked up a copy and read it with great interest. I joined Tripoli in 2000, and went to my first high power launch in 2001. I also re-joined NAR, getting my old membership number back. I particularly enjoy building rockets with a high degree of "hot rod" quality finish. I have built a spray booth, and I use professional quality automotive spray guns and paints. I enjoy working with composites and fabricating many of my own parts, as well as the tooling to make the parts. I also enjoy rocket science. As an engineering manager, I don't get much of a chance to practice engineering, so the rocketry hobby gives me a chance to do real engineering work. About the same time I was re-discovering high power rocketry, I had a couple weeks of recovery time from knee surgery at home to fill, so I took a closer look at my copy of Advanced Topics in Model Rocketry that I had bought at an MIT Press overstock book sale for $0.50 in 1976 (a used copy sold for over $300 before it was re-published). That started me down the road of exploring the modeling of the dynamics of model rocket flight. I have built a built a complete flight simulator for the purpose of exploring and understanding the dynamics of flight (I still use RockSim for actually predicting the altitude of my rockets). I probably spend as much or more time doing "rocket math" late at night as I do building and flying.